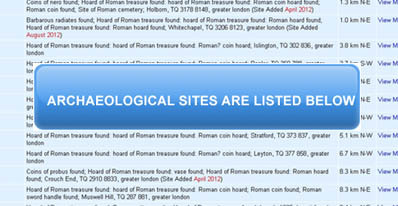 The ARCHI database has found 254 archaeological sites within 10 km of , Llanmaes, South Glamorgan. Data from British Archaeological Records, Historic Sites and Monuments Databases, Local History Sources, Metal Detecting and Treasure Hunting Reports and Archaeology Research Reports. ARCHI has found within 10 km of , Llanmaes, South Glamorgan 78 Roman archaeological / historic / ancient sites and monuments. See below for details of these sites. Roman sites within 10 km SS9769 Archaeology and Ancient History of Llanmaes, South Glamorgan, British National Grid Reference: SS9769; E-N: 297000 169000; Decimal Latitude/Longitude: 51.410635, -3.482365 View Old Victorian Ordnance Survey 6 inch to 1 mile Map 1888-1913 of , Llanmaes, South Glamorgan. ARCHI has found within 10 km of , Llanmaes, South Glamorgan 1 Romano-british/Iron Age / Celtic archaeological / historic / ancient sites and monuments. See below for details of these sites. Romano-british/Iron Age / Celtic sites within 10 km SS9769 Archaeology and Ancient History of Llanmaes, South Glamorgan, British National Grid Reference: SS9769; E-N: 297000 169000; Decimal Latitude/Longitude: 51.410635, -3.482365 View Old Victorian Ordnance Survey 6 inch to 1 mile Map 1888-1913 of , Llanmaes, South Glamorgan. ARCHI has found within 10 km of , Llanmaes, South Glamorgan 6 Anglo-Saxon archaeological / historic / ancient sites and monuments. See below for details of these sites. Anglo-Saxon sites within 10 km SS9769 Archaeology and Ancient History of Llanmaes, South Glamorgan, British National Grid Reference: SS9769; E-N: 297000 169000; Decimal Latitude/Longitude: 51.410635, -3.482365 View Old Victorian Ordnance Survey 6 inch to 1 mile Map 1888-1913 of , Llanmaes, South Glamorgan. ARCHI has found within 10 km of , Llanmaes, South Glamorgan 38 Iron Age / Celtic archaeological / historic / ancient sites and monuments. See below for details of these sites. Iron Age / Celtic sites within 10 km SS9769 Archaeology and Ancient History of Llanmaes, South Glamorgan, British National Grid Reference: SS9769; E-N: 297000 169000; Decimal Latitude/Longitude: 51.410635, -3.482365 View Old Victorian Ordnance Survey 6 inch to 1 mile Map 1888-1913 of , Llanmaes, South Glamorgan. ARCHI has found within 10 km of , Llanmaes, South Glamorgan 23 Bronze Age archaeological / historic / ancient sites and monuments. See below for details of these sites. Bronze Age sites within 10 km SS9769 Archaeology and Ancient History of Llanmaes, South Glamorgan, British National Grid Reference: SS9769; E-N: 297000 169000; Decimal Latitude/Longitude: 51.410635, -3.482365 View Old Victorian Ordnance Survey 6 inch to 1 mile Map 1888-1913 of , Llanmaes, South Glamorgan. ARCHI has found within 10 km of , Llanmaes, South Glamorgan 79 Medieval archaeological / historic / ancient sites and monuments. See below for details of these sites. Medieval sites within 10 km SS9769 Archaeology and Ancient History of Llanmaes, South Glamorgan, British National Grid Reference: SS9769; E-N: 297000 169000; Decimal Latitude/Longitude: 51.410635, -3.482365 View Old Victorian Ordnance Survey 6 inch to 1 mile Map 1888-1913 of , Llanmaes, South Glamorgan. ARCHI has found within 10 km of , Llanmaes, South Glamorgan 1 Mesolithic archaeological / historic / ancient sites and monuments. See below for details of these sites. Mesolithic sites within 10 km SS9769 Archaeology and Ancient History of Llanmaes, South Glamorgan, British National Grid Reference: SS9769; E-N: 297000 169000; Decimal Latitude/Longitude: 51.410635, -3.482365 View Old Victorian Ordnance Survey 6 inch to 1 mile Map 1888-1913 of , Llanmaes, South Glamorgan. ARCHI has found within 10 km of , Llanmaes, South Glamorgan 1 Unclassified historic archaeological / historic / ancient sites and monuments. See below for details of these sites. Unclassified historic sites within 10 km SS9769 Archaeology and Ancient History of Llanmaes, South Glamorgan, British National Grid Reference: SS9769; E-N: 297000 169000; Decimal Latitude/Longitude: 51.410635, -3.482365 View Old Victorian Ordnance Survey 6 inch to 1 mile Map 1888-1913 of , Llanmaes, South Glamorgan. ARCHI has found within 10 km of , Llanmaes, South Glamorgan 2 Industrial archaeological / historic / ancient sites and monuments. See below for details of these sites. Industrial sites within 10 km SS9769 Archaeology and Ancient History of Llanmaes, South Glamorgan, British National Grid Reference: SS9769; E-N: 297000 169000; Decimal Latitude/Longitude: 51.410635, -3.482365 View Old Victorian Ordnance Survey 6 inch to 1 mile Map 1888-1913 of , Llanmaes, South Glamorgan. ARCHI has found within 10 km of , Llanmaes, South Glamorgan 7 Dark age archaeological / historic / ancient sites and monuments. See below for details of these sites. Dark age sites within 10 km SS9769 Archaeology and Ancient History of Llanmaes, South Glamorgan, British National Grid Reference: SS9769; E-N: 297000 169000; Decimal Latitude/Longitude: 51.410635, -3.482365 View Old Victorian Ordnance Survey 6 inch to 1 mile Map 1888-1913 of , Llanmaes, South Glamorgan. ARCHI has found within 10 km of , Llanmaes, South Glamorgan 2 Norman archaeological / historic / ancient sites and monuments. See below for details of these sites. Norman sites within 10 km SS9769 Archaeology and Ancient History of Llanmaes, South Glamorgan, British National Grid Reference: SS9769; E-N: 297000 169000; Decimal Latitude/Longitude: 51.410635, -3.482365 View Old Victorian Ordnance Survey 6 inch to 1 mile Map 1888-1913 of , Llanmaes, South Glamorgan. ARCHI has found within 10 km of , Llanmaes, South Glamorgan 16 Tithe map data archaeological / historic / ancient sites and monuments. See below for details of these sites. Tithe map data sites within 10 km SS9769 Archaeology and Ancient History of Llanmaes, South Glamorgan, British National Grid Reference: SS9769; E-N: 297000 169000; Decimal Latitude/Longitude: 51.410635, -3.482365 View Old Victorian Ordnance Survey 6 inch to 1 mile Map 1888-1913 of , Llanmaes, South Glamorgan.